Widespread, catastrophic flooding across southern Louisiana this month damaged more than 100,000 homes, and killed 13 people. 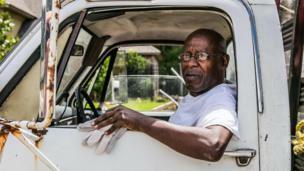 The project Humans of the Water set out to capture portraits of Louisianans after floodwaters wrecked homes and washed away memories, and to chronicle what was lost and what was saved. 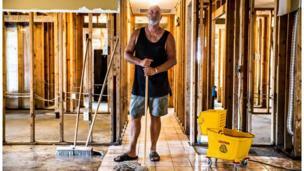 Phillip "Mooney" Brignac, 58, finishes the clean-up of his home in St Amant. He has lived there since 1991, raising two children. “We will definitely rebuild. We are St Amant strong. We will do whatever we’ve got to do," he says. Stephanie, 29, takes a break from cleaning her parents' home in St Amant. They managed to save her great-grandmother's table, which had already been restored several times and will now need more repairs. "I have three family members living with us. They don't know what they're going to do," she says. "My mom is not coming back here. It's just too much. They are going to stay as long as they need to." Aiden and his little sister, Jubilee, sit on what's left of their bunk beds in the Baton Rouge home they moved into just a few months ago. "Today we're going to call it an early day so that Aiden can celebrate his birthday," their mother Mimi says, "because not even this flood should get in the way of that." 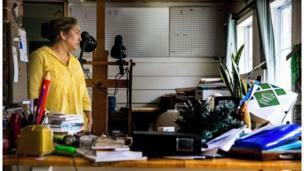 Rosanna Sigue, 59, surveys what was once the painting studio she set up in Baton Rouge after retiring from decades of teaching. 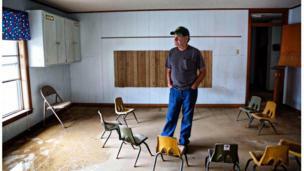 A recording of her late father's voice was lost in the flood waters. "I've never felt such loss," she says. Hilton Pray, 82, holds on to one of thousands of photographs that were damaged after an estimated 1.2m (4ft) of water filled his home off of Greenwell Springs. He had built an entire model village behind his home, complete with a general store and chapel. 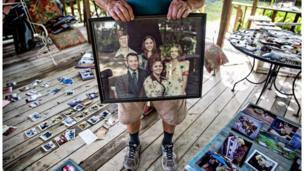 It was washed away along with many antiques and mementos of his life as a collector. Ronnie Carroll, 70, a mission worker from Roberstdale, Alabama, stands in a children's bible study room in the First Baptist Church in Baker. "It's heartbreaking... I believe a tornado is better because you just lose everything at once, and it's gone, it takes it with it. A flood, they can see it. They can touch it, and they want to fix it but can't." 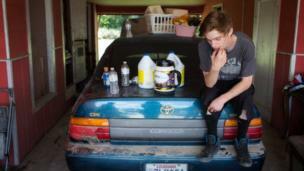 Jesse Poche, 23, sits on one of his cars in the garage of his damaged home in Denham Springs. He was able to save some of his belongings in plastic bins. "Slowly but surely I will regain everything I lost," he said. Charles Tripp, from Rome, Georgia, walks Louie the dog down his sister-in-law's street. He came down with family in a motorhome filled with supplies. "I am supervision, they're labour," he said, pointing to family members, "I just had heart surgery." Joe Elder, a native of New Orleans, came to Baton Rouge to help with the relief. 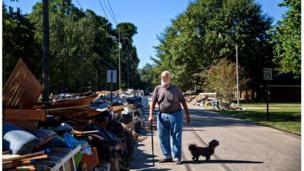 "We see similarities with Katrina here, all of the debris. Being a combat veteran it looks like a disaster." 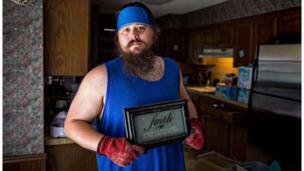 The first thing Adam did when he returned home is straighten the "Faith" sign above his door. His home off of Greenwell Springs was overwhelmed with water. 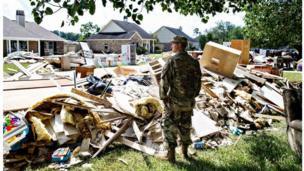 National Guardsman Chris Daves surveys the damage from a friend's yard in Watson. He is there to help and listen, he says. "We're fellow Army men, that's what we do." Daryl is a lifelong Christian missionary who works with trafficked children in the highlands north of Mexico City. He returned to Baton Rouge when he learned his home there was damaged and his family had been forced to evacuate.